Click here and scroll down to view five examples of Hopper’s paintings. In the book Hopper’s Places, author Gail Levin pairs Hopper’s paintings with photographs of the actual scenes that he painted. Edward Hopper, one of the foremost American realists of the 20th century, painted urban and rural scenes, such as motels, gas stations, lighthouses, and drugstores. He was the first artist to capture the American visual world and make it his own style. Born in 1882 in Nyack, New York, Edward and his sister Marion grew up in a happy home. He was a good student and already showed talent for drawing at the age of five. Both of his parents encouraged his art and supplied him with sufficient materials, as well as magazines and books. By his teens, Hopper was working in pen and ink, charcoal, watercolor, and oil. His father, a dry-goods merchant, thought that a career in the fine arts was too risky and encouraged him to study illustration for security. One of his teachers was the artist Robert Henri, a leader in American realism, who urged him to study all aspects of urban life and to portray how he felt about it. Often referred to as “soft” realism, Hopper’s paintings are of simplified shapes and details. Sunlight fascinated him and he used it masterfully to create moods. He said, “What I wanted to do was paint sunlight on the side of a house.” He worked with vibrant, almost flat colors with no apparent brushstrokes, clearly defined forms, and strongly defined lighting. His paintings of people are cold and mechanical, while his paintings of houses are full of character with window shades at various heights, cropped compositions almost cinematic in their viewpoint, and a sense of motionless silence. A road, city street, railroad embankment, or porch step often cuts across the foreground, creating the transient effect of viewing the scene on a stage. The surrounding landscapes are sparse and free from patterning or unnecessary detail. Three trips to Europe had little influence on Hopper’s style, which remained consistent throughout his career. He eventually settled in Greenwich Village in New York City, spending summers along the New England coast in Cape Cod and Maine. He also traveled extensively in the United States, making road trips by car, in search of subject matter. Edward Hopper was 84 when he died in 1967. Become familiar with the life and paintings of Edward Hopper. Set out pencils, paper, tempera paints, brushes, containers of water, sponges, and optional mixing trays. Gather examples of Hopper’s paintings. Tell the children about the life and works of Edward Hopper and share the examples of his works. Explain that his style is referred to as realism because he made lifelike paintings of common everyday places. 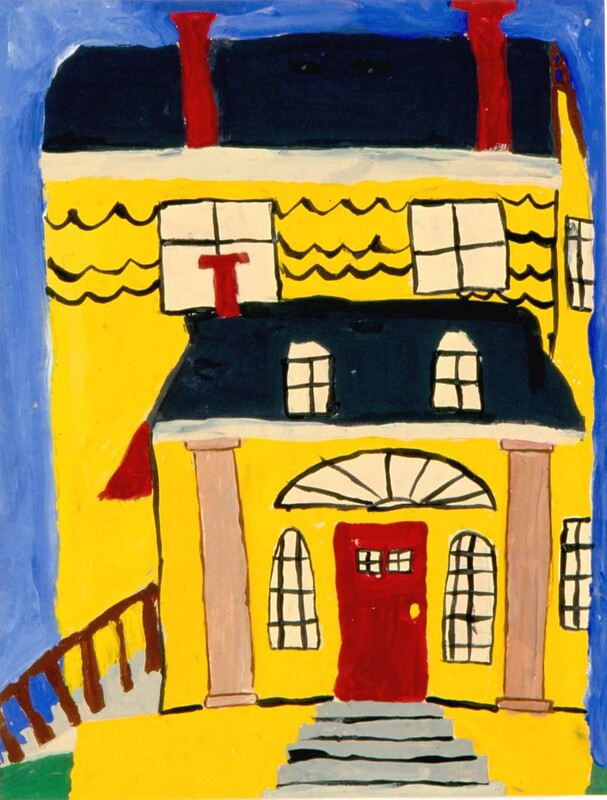 In this session the children will be making paintings of houses using Hopper’s style. Discuss how Hopper painted houses with lots of character using vibrant, almost flat colors with no apparent brushstrokes, clearly defined forms, and strong lighting. Point out details such as window shades raised or lowered to various levels, the cropped houses which sometimes run off the edges of the canvas, and the sense of motionless silence in his paintings. Explain that in this session the children will be using pencils to sketch or draw a house or part of a house without the details. They should draw only the basic outlines, or shapes, of the houses and additions such as windows, doors, steps, and columns. Decorative details will be added in the next session. When the sketches are completed, the children should paint the first layer of color on their houses, as well as the surrounding background like sky and grass. 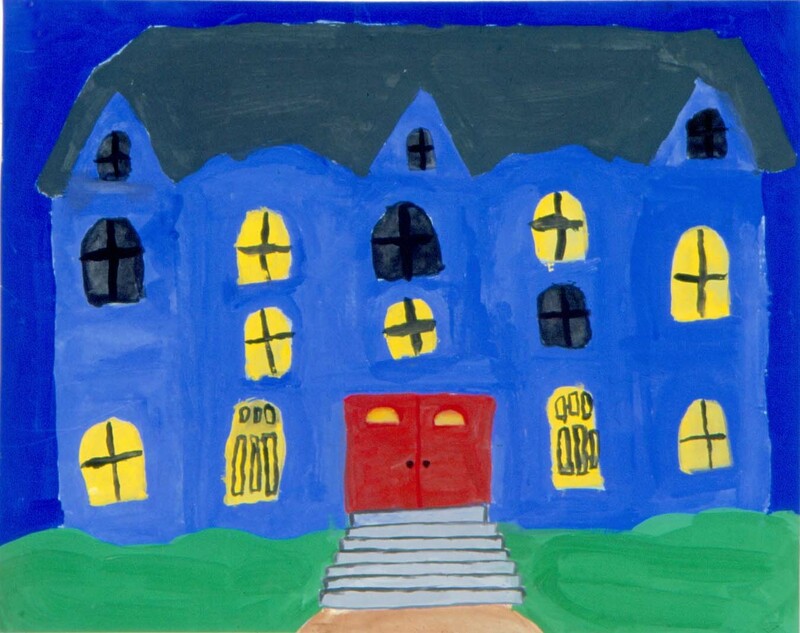 Have the children sketch the basic outlines for the houses and apply the first layer of paint. Set out the paintings from the previous session. Set out paper, tempera paints, brushes, containers of water, sponges, and optional mixing trays. Review Hopper’s style of using vibrant colors and strong lighting. In this session the children will be adding details to their paintings. Encourage them to include items such as bricks or siding for the buildings, shutters for the windows, and scenery around the buildings. Remind the children that when painting over dried paint, they should dip their brushes into the paint often to avoid scrubbing with the brush which will cause the bottom layer of paint to become wet and mix with the top color. They should dry the brush well after rinsing between colors to keep the tempera paints from becoming too watery. Have the children complete their paintings with additional details. If using mixing trays, show the children how to lift dollops or puddles of paint onto the trays with their brushes before mixing the colors together. This will avoid watery colors that have been scrubbed onto the paper due to mixing too little paint to cover the area. 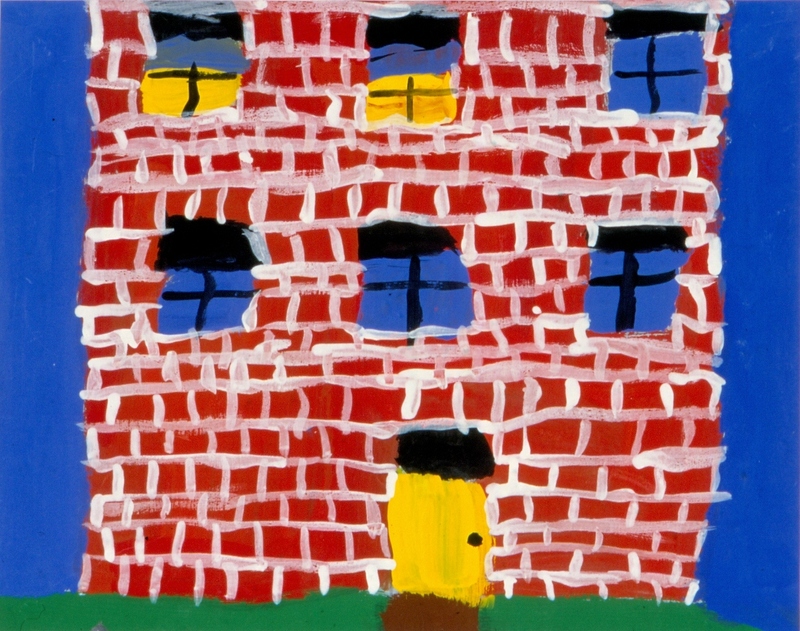 Painting houses in the style of Hopper is a good introduction to the lesson on making clay houses. Review Hopper’s style of painting. Have the children tell how they felt while using Hopper’s style. Discuss the characteristics of Hopper’s style that can be seen in the children’s paintings. I put black panes on my windows. Now how can I make it look dark in some of the windows? 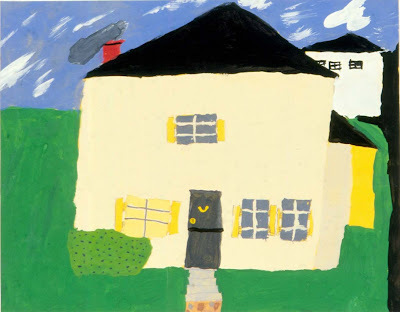 I’d like to paint a picture of a house that I pass everyday on my way to school. Do I have to paint every detail that is on the house that I saw? We will still be able to see the black panes on your windows if you paint the inside of the windows with another dark color or add a little bit of white to make a lighter shade of black. Hopper also painted houses that surrounded him or ones that he saw while travelling. Hopper’s paintings are called “soft” realism. Although he painted what he saw, he decided which details he wanted to include. You can also decide which details to include in your painting.